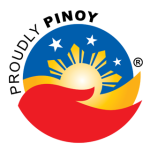 The Department of National Defense initiated the P3 billion Combat Utility Helicopter acquisition project in July 24, 2008. This acquisition was for the Philippine Air Force, but because of its amount, it fell under the responsibility of the DND Bids and Awards Committee (BAC). The project sought eight (8) utility helicopters that could, among other things, carry a crew of four, with eight passengers with a minimum payload of 3,000 lbs. Deliveries of the first four helicopters are expected in November 2011. July 8, 2008 Pre-Procurement Conference for PAF Combat Utility Helicopter (CUH) Acquisition Project. 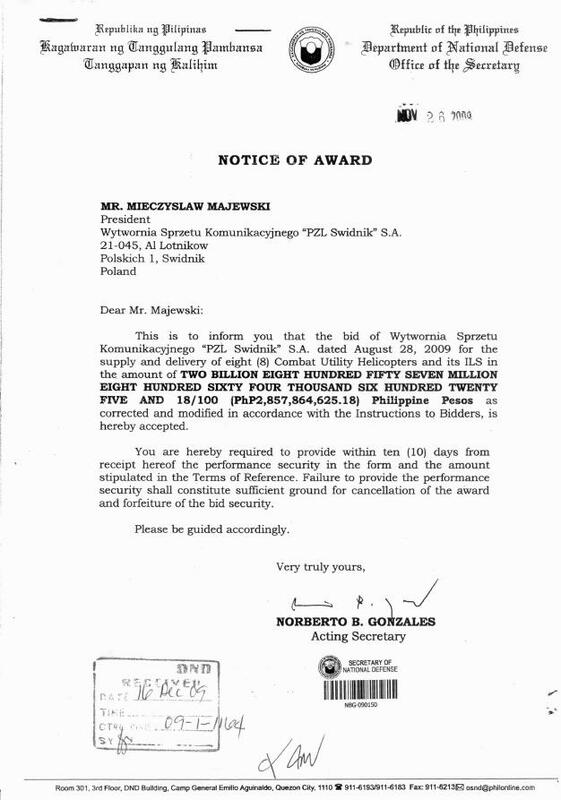 November 26, 2009 Issuance of Notice of Award in favor of PZL Swidnik. 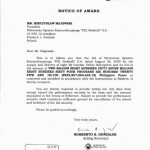 NOA was approved/signed by the Secretary of National Defense. Click image below to enlarge.